There is no question that manufacturers and retailers have been contending with difficult product decisions for a couple of years. Foremost has been the price of gold, which has made made some hot products of the past into things of the past. An Italian gold chain manufacturer pointed that out to me in describing where his business has gone. At one time he cranked out tons of gold as machine-made chain, but that has essentially disappeared. Italy now has perhaps six companies left that are making machine-made chain, and most of that is silver - 90% in his case. OK, one might say, that is a reality, but at least consumers are buying silver chain. Is that all there is to it? Exchanging gold for silver, or steel, or titanium, or rubber? I think not. No doubt that retailers need to fill price points, and some have stated that silver has been a huge help. But are more profound changes happening? No doubt. Unity Marketing recently wrote about their survey of consumer preferences. "In our most recent survey of luxury jewelry customers, we found that the share of luxury consumers who purchased jewelry rose from 13 percent to 15 percent. While this measure of demand still lags the 18 percent tracked in 2010, it points to people’s willingness to shop once again for jewelry items. But what they don’t seem willing to do in the current environment is spend more for the jewelry items they buy. The amount spent on jewelry was down both from previous quarter and same period last year. In the current environment, luxury jewelry shoppers are making choices for less expensive, more affordable jewelry items. In today’s jewelry market value is key and even high income consumers who can afford the real thing are opting for less-expensive metal and gemstone options, as well turning to discounters and other value-oriented retailers to make purchases. The key for jewelry marketers is to create strategies around the new realities of today’s jewelry customers – what they want; what they value; what features, benefits, experiences they are willing to pay more to obtain." That is well put. I put the key phrase in bold, but what Unity Marketing, and others, are describing is the real shift to a variety of alternative products that serve a need (adornment) that fits their life styles (transitory fashion) and perceived value. Our tendency is to believe that marketing assumptions of the past decades have been carved in stone. But even in our lifetimes we have seen societal changes that should be telling us that the standards and values once thought to be eternal are subject to great changes. The Jewelers Board of Trade, in their most recent analysis of market trends, only reinforces a belief that the changes we are seeing are profound, suggesting that the jewelry business is undergoing a broad-based transformation that affects product ranges, marketing focus, and business models. The JBT analysis shows a continuing decline in the number of jewelry stores, particularly among independents, that has been going on for decades. The cause, at one time,was the explosive growth of chain stores, discounters, TV, and other mass marketers. Now it is the maturing of Internet retailing (which is growing at double digits) and the rising prices of precious materials. I venture to add that independent retail stores are not readily salable. Who, after all, would spend millions to buy a one-store operation that requires 5-6-7 day weeks and comes with (undoubtedly) a load of dead inventory. Sometimes, a younger generation wants to take over, but that has become a rarity. Many issues compound the problem of adapting to this rapidly changing environment - more than we can do justice to here. It takes a careful and lengthy review. But here are three aspects that just start the conversation. Many, if not most, retailers view the bridal category and diamonds as the core of their business. De Beers is quite right to say that supply will diminish, and if we faced a pure supply/demand equation the outlook would simply be for rising prices and fewer dealers and retailers. But unlike almost any other product, diamonds retain value and are efficiently recycled, making the US public into one of the best sources for diamonds in the future. There are billions of dollars in private hands in the US alone. At the same time, the Internet has become the pricing standard for most decent quality stones over a quarter carat. That has driven margins down. Add to that a declining marriage rate, birth rate, aging Boomers, changing lifestyle values, and a disappearing middle class, and we have a stressed jewelry category. Gone? Not by any means. But definitely indicating much more power in fewer hands. Another aspect. Precious gem productions are falling. Yes, if you go to trade shows it looks as if there are tons of stones for sale. But very fine colored stones are already in very short supply, and declining. Mines are played out or closing, and some governments are making opening new ones very difficult for environmental reasons. Quartz, in all its colors, is still plentiful, but even there the outlook for clean material is uncertain. Diamond production is falling worldwide, as even De Beers recently acknowledged, with no major finds in sight. So, if anything, we know that the top of the market will become even more expensive. And, if we consider what Unity Marketing has to say, that pie will get smaller and there will be less room for both suppliers and retailers. Third aspect. Silver has been a life-saver for many people, providing a precious metal that consumers will know and accept. The use of silver, both with and without stones, recaptured important price points and pleased consumers with great value perception. For manufacturers and retailers, silver also offered margin relief, generating better bottom dollar profits even with lower retail tickets. But now that is changing too. So many companies have gotten on board that margins are shrinking as competition has increased. For companies that swapped top line dollars for better bottom line dollars, this could present some real problems. In all of this, it remains clear that the jewelry business is not going away - it still is one of the most important gift categories, if not the most important one. How we fit, how we respond, and how we address such different conditions is the central question. Christmas 2012 - good, bad or indifferent? * The number of jewelry retailers in the United States continues to decline, by 2.5% last year, according to JBT. There are now around 22,000 jewelry stores in the US. (The number of manufacturers and wholesalers has also declined by a few percent.) At one time a couple of decades ago there were more than 30,000, and further back, 40,000. Back then, the US population was much smaller, so by rights we should have seen growth - if the business model was viable. A part of that decline can be attributed to the nature of the business. Family run, they present very little "cash out" options other than liquidation when owners seek to retire and there is no younger generation stepping in. Would you pay millions to buy a single store retail business? And work long hours and long weeks? So the wheat has gone out with the chaff. Many stores may have failed, as in the latest severe recession, but many strong operations disappeared simply for lack of continuity. We now have strong survivors that are increasingly dominating local markets. That pretty much assures that we will see further declines in the number of stores. Fewer, stronger stores, pursued by many suppliers. * ShopNBC is reducing airtime for jewelry, shifting to lower-priced categories. Right before the Christmas season? 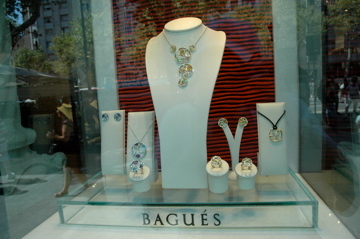 Jewelry has been a leading category on TV shopping stations for as long as they have been around. Is jewelry really getting that weak? * Signet Jewelers Ltd. bought Ultra Stores Inc., operator of the Ultra Diamonds for $57 million in cash. Again, right before the Christmas season? In years past, a chain that sought a merger or buyout would at least make the most of the Christmas season with big discounts and promotions. I am strictly speculating, but was Ultra so strapped that it could not stock for the season? The price paid (well below $1m per store) suggests that. Ultra, according to Signet, is a very strong outlet mall operator, which is an important business model. Apparently the Ultra name does not mean much. All stores will become Kay stores by around mid-2013. Over the last 30 years or so, some 50 mall-type chains have either closed, merged or been bought out. How many new ones have arisen? None. Then we get some prognostications on the coming season. * According to the 2012 Survey of Affluence and Wealth in America, produced by American Express Publishing and Harrison Group, only the most affluent will increase their buying this year. The survey polled 625 affluent U.S. households and found that gift giving among the wealthy will decrease 3.4%. However, the top 10% will increase their gift spend 21.9%. The other 90% percent intend to spend 10.9% less. Overall, 26% of respondents plan to purchase jewelry or watches. If I read this right, in the opinion of Amex and Harrison think 2.5% of the top 10% of earners will buy jewelry this year. Everyone below the top 10% will spend less. So, not that good. * On the other hand, National Jeweler, reported that Bain & Company said it expects worldwide luxury revenues to increase 7% in the 4th quarter of 2012. Jewelry is projected to increase 13% and watches 14%, with both categories to show the strongest gains in 2012. Only hotels, at 18 percent, leather goods, at 16 percent, and shoes, at 13 percent, are expected to perform as well or better this year. Well, great! So this sounds much better. No need to go further. The guesses are all over the map. But that does not deter me from taking a shot. No survey, no phone calls to affluent households, just a simple look at some charts. I do that because our economy is so complex that pat predictions are not really of any help. Jeff Miller, on Seeking Alpha, showed some worthwhile information. The credible Conference Board tracks economic changes. Here it shows the effects of eight recessions. The last one created the deepest decline, but we have been making steady, though slow, improvement for over three years. We can safely assume that jewelry will trail other categories as the public deleverages and spends on necessities before getting to discretionary purchases. Below we see that retail sales (shown as a % change over the previous year) have made substantial gains since the depth of the recession. The growth has flattened a bit after the solid advances of last year. So the public is not loading up credit cards. In a way, that is good. At least sales continue a few percent above last year. Even more encouraging, the key economic indicators have all steadily advanced for 40 months. More to the point in our industry, the IDEX index of diamond prices shows a significant drop. Without addressing the reasons for what drove prices up in the first place, we can at least say that current prices will (hopefully) be reflected at retail stores, lifting sales. All of this tells us the retail sales will be a few percent over last year, and I am not an economist by any stretch. What we do not know is the share that jewelry will get. Bridal will do well, but for an individual retailer there are questions even there. So many more suppliers and retailers have enlarged or entered that category, so pie slices may be smaller. Will consumers continue to buy silver, or will they step down further and but costume jewelry for even lower prices. That is a subject for another day. But we can expect a decent Christmas. We wish a quick recovery for those battered by Sandy, and wish everyone a most Happy Thanksgiving. We read with interest the recent statement by De Beers of structural corporate changes. Present divisions will disappear, more notably DTC and Diamdel, and operations will be consolidated under the De Beers name. The release emphasizes that operations continue as before; that the Sightholder designation and its marketing franchise continues; and that operationally everything is the same. But, of course, it is not the same. The statement does make it clear (or rather unclear in the corporate speak we have heard before) that the market has changed, and that De Beers must refocus its thinking and planning to be based on the consumer. If I can interpret, it sounds like business will become more demand driven than supply driven. That has been the reality anyway for a while. Now it is being institutionalized. But this cannot be all there is to it. Let's speculate a bit, which is all we can do, about the possible/probable motivations. As for the name changes, we have seen some before. Some of us can recall that DTC used to be CSO. At the time, the renaming seemed to suggest that De Beers wanted to go in new directions and had new management objectives. And we progressed into the age of Supplier of Choice. Now, once again, this consolidation and dropping of divisional names has to mean that changes are afoot, as even Varda Shine indicates. First, we should note that concurrent with this announcement came the (expected) announcement that Cynthia Carroll, Chief Executive of Anglo American, is the new chairman of the board of De Beers. Two other Anglo management executives have also been named to the board. So the first changes came immediately. As I have believed all along, Anglo will bring a different perspective to De Beers operations. Over all the decades that Anglo has been part owner of De Beers, it has been the Oppenheimer family that has shaped and driven policy. That is no longer the case, and Anglo will take, I believe, a very practical approach and will seek efficiency and profits. De Beers, on its own, has wrestled with the changes brought by loss of its monopoly. The core objective of enhancing the image and value of diamonds through a variety of marketing and advertising programs benefited competitors as much as De Beers during those years of transition. The ad campaigns yielded to "beacon" programs, which everyone tailgated anyway, and finally to the current Forevermark program. The intent was always to build demand and to create added-value for De Beers. But it has always been a question, in spite of some successful campaigns in the past, as to whether the benefits outweighed the costs. The marketing arm no doubt argued for it, while the mining people probably argued against it. Now it is the mining interests that are in the forefront. De Beers still manages major productions, and its operations in assorting, distributing and selling of rough are essential for many downstream operations. De Beers certainly does not want to rock the boat. At the same time, as even the statement suggested, the market has changed. Major diamond companies now source rough from many sources, even as the De Beers sights remain an important anchor to their businesses. But, other than Forevermark, added-value programs are gone, and even that one still has to prove its value even though it is hypothetically set up to be self-funded. De Beers, and the other major producers, have been drifting further and further towards tenders, and it makes sense. Using auctions maximizes profits, and it can be done to reflect market conditions - set reserve prices; establish lots that move all qualities, not unlike sights; require deposits; and adjust production to meet sales experience. Auctions open up the primary sources to many companies that would not qualify, for one reason or another, as sightholders. As it is, we see sightholders declining or deferring sights without being dropped, and Diamdel steadily selling into the second tier market. In dropping the DTC and Diamdel names De Beers (Anglo) is saying "sales are sales" regardless of how we generate them, and it should come through one operation. This will lower need for personnel and tie the mining and sales departments much closer together. Makes sense to me. As for the fear that major cutters will not be assured supply, I think sights will continue for a while even if greater and greater emphasis will be placed on tenders. (I commented on this in my blog of last year called "Tender is the sight.") At some point, the distinctions will disappear, even if the marketing angle of being a sightholder continues. As a practical matter, it will be most efficient for cutting operations to be consolidated some, with rough buyers arranging for goods to be cut. That is already the case to a degree. Larger factories cutting for many rough buyers and dealers. Everyone will benefit from that. De Beers continues to gradually migrate to a new. and very different operation. 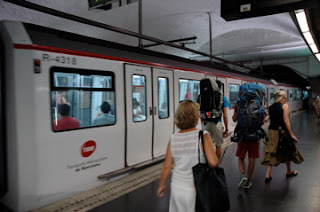 We spent a few days in Barcelona, then drove up the coast to Aiguablava, a small town on the Costa Brava. Then went on for a day visiting the old city of Girona before coming home. We took nearly 800 photos and here is a small sampling, with a few comments as we go along. I hope you like the impromptu tour! 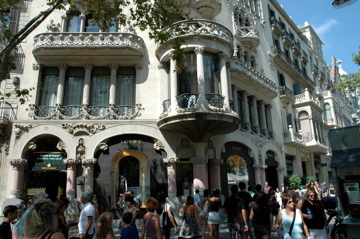 Barcelona, even in August's heat, is a wonderful place to visit. 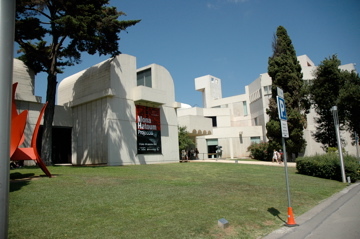 The city is bounded by hills to the north and the Mediterranean to the south. The waterfront is partly port and partly beaches, and the two work well together. The city greatly improved the waterfront for the 1992 Olympics, as were the broad avenues that traverse the city. Barcelona is a wonderfully photogenic city. The old and new mix everywhere. 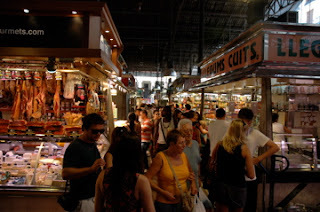 The main tourist strip - La Rambla - is not a place to spend any time, except for the marvelous market, where locals shop for meats, cheese and fruits. One is overwhelmed with sensory stimulation, and the desire to taste too much! 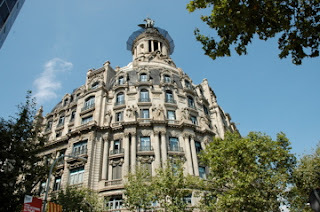 But La Rambla leads us down to El Gotic, the old section of downtown dominated by the cathedral, where we see ancient walls and the narrow alleys that preceded the advent the car by centuries. Tapas24 - don't miss this. Nothing is more central to life in Barcelona than food - and it is exceptional. 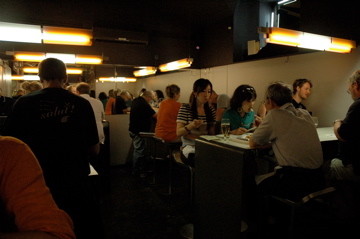 We waited over an hour to get into Tapas24 (no reservations!) at about 9:30 PM. The best tapas we have ever had, by far. The place itself, in a basement, can best be compared to an overcrowded school lunchroom. But you have never seen so many happy people. The city's architecture often stops us in our tracks. 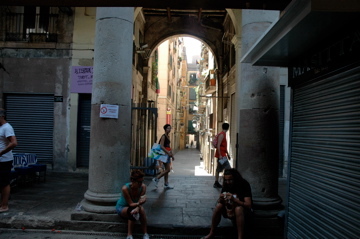 The city has very few tall buildings, and many broad avenues, giving the city full access to the Mediterranean sun. The Spanish touch is classic, with beautiful details. Very gracious. 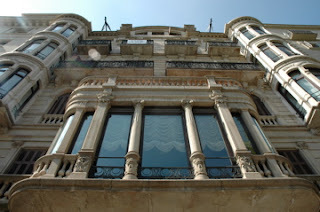 This building, on Passeig Gracia, stopped everyone. Eye candy! Some beautiful jewelry to be seen - I am still on a busman's holiday. 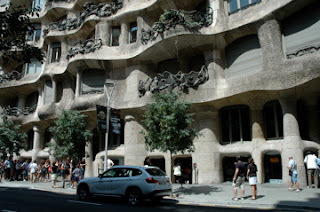 Just down the avenue is Antonin Gaudi's famous La Pedrera. The creativity shown here in a building finished in 1912, is unlike anything I can recall. It is timeless, and stands out totally by itself as a stroke of genius. 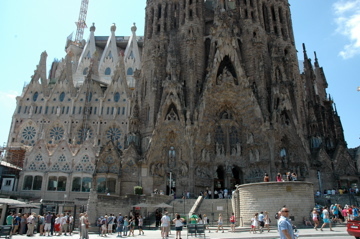 It was our first exposure to Gaudi's work, and we breathlessly gaped at his creativity. Here is a close up of the wrought iron railing of the balconies. 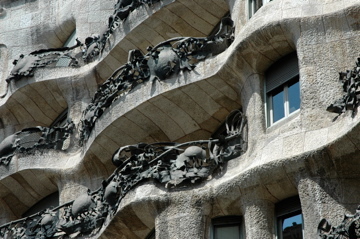 Gaudi's designs are organic, and filled with nature's fruits - executed in flowing lines of iron. 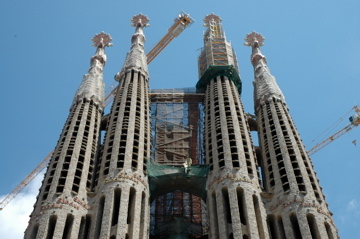 These are shots of Gaudi's Sagrada Familia, a cathedral begun well over 100 years ago (started in 1882, and still not complete!) 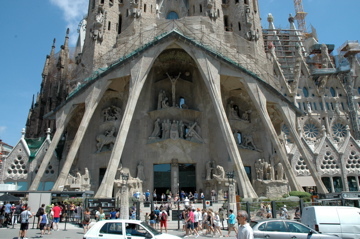 is a breathtaking structure; immense, stunning in design and truly inspiring. There is no way that photos can convey the beauty and magic of this World Heritage structure. This site alone warrants a visit to Barcelona. I have no way of knowing, but the tops of the spires are probably 40 stories up. We did not go inside (2 hour wait when we were there), but do go to Wikipedia and see more shots and details of how construction is now being accelerated using computers to precut all stone. Before, it was all done by hand. Time to completion has now been cut from 100 years to about 15. 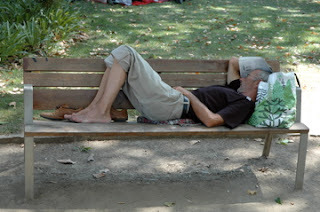 AH, siesta time. We saw this everywhere. People still sleep from 2PM to 4PM. Got to rest up for those 10PM dinners! Subways are great, easy to use, and quickly take you to any part of the city. The small, very well done, museum Caixa Forum, near the Palau Nacional. Housed in this museum was an exhibition on the history of skyscrapers, starting with a conception of the Tower of Babel, through all the great building of the US, Asia, and Dubai. 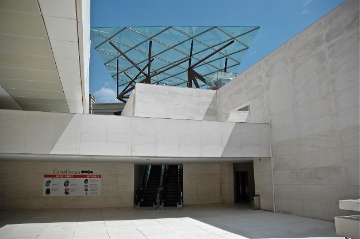 The building is a blend of very clean modern space, wrapped around a winery built for the 1929 Exhibition that included all this area. 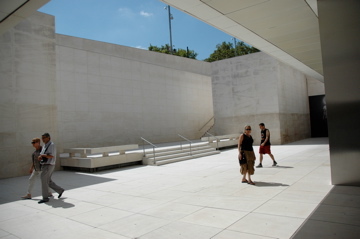 Across the street is a re-built, simple pavilion that was Mies Van der Rohe's contribution to the 1929 Exhibition. 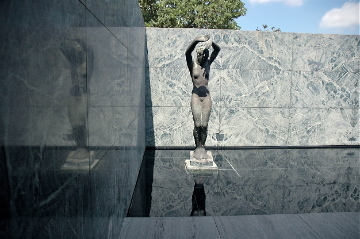 That such a building was created in 1929 is a tribute to Mies's vision. 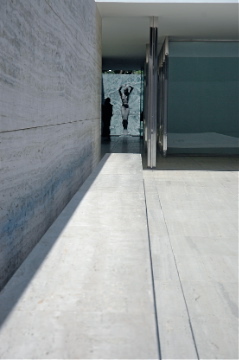 He set the path towards so much of contemporary architecture. It was Germany's contribution to the Exhibition, and afterwards they could not sell it to anyone, so it was taken down and scrapped! 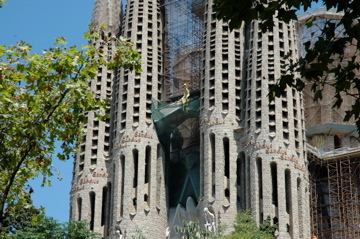 Some years ago the decision was made to rebuild it, and it was replicated to the smallest detail and identical materials. Except that I found a mistake! The window frames were secured with Phillips head screws - which were not invented in 1929! The attendant was duly impressed, and said yes, that was the one mistake made. The statute was taken back to Germany in 1929, and during the war was lowered into the Rhine to protect it. It was found for the reconstruction, and an exact replica was made. 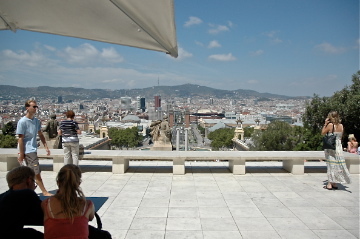 This is a view of the Palau Nacional. 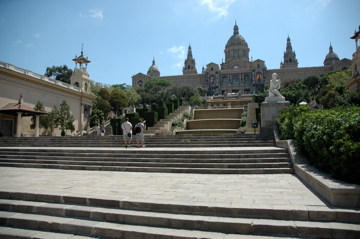 This huge structure, the dominant element in the 1929 Exhibition, atop the Montjuic ("Mount of the Jews", because here is where the ancient Jewish cemetery is located) is accessed via countless staircases and outdoor escalators. And below is the view from the top. Quite a spot. 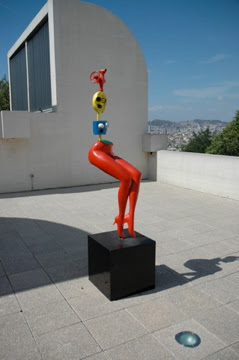 Just further up the mountain from the Palau, is the Miro museum. An island of style and great art. 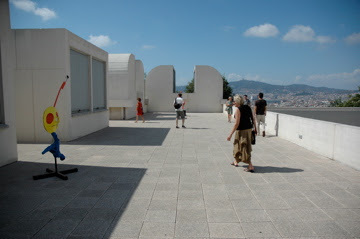 The rooftop of the museum, high above the city, is a quiet zone. The sight lines. 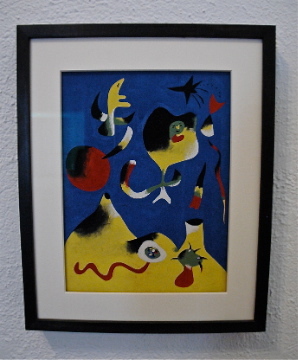 the well-placed, bright art works; the brilliant light, make this a very special place. We loved it. I still hear about retailers who think they can bully and threaten suppliers who dare to post their products, in one way or another, on the Internet. Not only is that a teaspoon against the tide, but it is an astounding failure to understand retail dynamics and the remarkable transition we are seeing. Looked at narrowly - only in respect to the so-called battle between bricks and clicks - the issue is plain to see. Even if a supplier does not open their own web site, their customers will post images and information about the products on their sites. It does not matter if the web site is a pure play web retailer or another traditional jeweler. The effect is the same - another retailer is "invading" the threatening retailer's territory. Moreover, every evidence indicates that the more a brand or product is shown, the more everyone selling the brand benefits. That, as I said, is looking at the issue narrowly. But traditional jewelers are dealing with many more issues in today's market. These days, as I noted in my last post, anyone dealing in true luxury can only view the Internet as a very helpful tool, not a competitor. I was referring to specialists in creating expensive home theater installations, or expensive jewelry. In our industry, some great examples are some New York-based diamond dealers. New York dealers have transitioned over decades from manufacturing and importing a full range of diamonds, to increasingly specializing in large, fine stones (some in special cuts) catering to wealthy individuals and stores dealing with wealthy individuals. This sort of specialization makes sense because demanding consumers want to deal one-on-one with competent and well-connected people. That cannot be out-sourced or even imported. Or managed on a web site. It comes down to market position. Woody Allen's famous line is "80% of success is showing up." I would add, showing up in the right place. One of the more extreme, and amusing, examples of that was in Dubai. I was there working on a project, and the people I was with wanted to get some alcohol for the evening, alcohol of course being forbidden in a Muslim country. We drove out to a fairly undeveloped area to an unmarked, gated warehouse. We parked inside a walled lot, and then entered a huge, very busy liquor store that carried every label imaginable. This was a destination that everyone "in the know" in Dubai apparently knew about, and it could just as well have been on Mars. In a similar way, all jewelers (on-line or not) need to become destinations, recognized by their community for delivering a service and product that makes them special. A brick and mortar store could be a diamond destination; or known for creating custom pieces; or known for carrying leading edge fashion; or even for throwing great parties. Such stores can negotiate on price, search for unusual stones, and quietly answer all the questions that a nervous customer might have. None of those aspects are particularly suitable to an Internet retailer. Remember that the Internet has a key characteristic - it makes plucking low-hanging fruit easy. Amazon did it in books, and eBay replaced the yard sale. In our industry, Blue Nile had retailers screaming threats at suppliers. But what happened is instructive. Blue Nile, in a few years, built a $300 million plus business selling loose goods - a truly remarkable and unique feat for our industry. And it happened because diamond grading essentially turned diamonds into commodities, much as Amazon did with books. It combined that with a very low-cost business model that effectively picked much of the low-hanging fruit by being well-organized, informative and massively inventoried with other people's diamonds. Many good retailers understood that Blue Nile, and the multitude of sites copying their technique, was a game changer. Diamonds above a certain size and quality - and below very large sizes - would no longer be the business it was. They began competing with Blue Nile on price for centers but still made better margins on mountings and smaller diamonds. But more importantly, they treated center diamonds as "naked." That is a term I have used for many years to describe any jewelry item that a consumer can easily price shop. It used to be gold chain, as an example. GIA-graded diamonds now fell into that category. Priced too high, and the consumer now believes that everything in the store is over-priced. And the reverse is just as true - priced competitively and the retailer has a customer. And now the worm has turned. Retailers have adapted to the age of Blue Nile, and Blue Nile has now seen flattened sales. They have made some price cuts, and expanded further into jewelry, in an effort to grow their business further. A balance has been reached. Much more can be said on the subject (and I am always happy to get your comments!). No doubt that where a store is located; how well it is merchandised; how effectively it reaches the right target market and brands itself; how owners connect with their community; and how thoroughly they service their customers can all spell the difference between success and irrelevance. Oh, and by the way, the Internet has a role in all of that. Best Buy has been in the news lately. Its founder has resigned his position, at least partly because business has been steadily declining over the last few years and a solution has not been found. It survived the collapse of two big rivals - Circuit City and CompUSA - and the street thought it would benefit greatly as the sole big electronics store. Apparently, that may not be the case. The Internet has hurt, and comparisons are made to software vendors, bookstores, magazines and newspapers. The reach, speed and low costs of Internet distribution spares nobody. How about jewelry retailers? The most common reaction we hear is that consumers want to "feel it, and try it on." Sounds sensible. But it is too narrow a view. Here are some angles to consider. In jewelry, the opposite may be happening. A consumer first searches on the net for appealing jewelry, and then goes to a store, armed with information and a price, to "feel it, and try it on." And, perhaps, buy it. That is, if the piece can even be found in a store. That is not the problem Best Buy usually has. On brands, I would bet that most jewelers will price match. (Now, sales people at Best Buy are authorized to do that - I have experienced that myself.) And is this why I hear of so many jewelers dropping brands? Or why we hear of jewelers being terribly put out to hear that a key supplier, say Hearts on Fire, will be opening 75 stores. This is an old complaint made by jewelers, and a bad one. Branding, especially in fashion jewelry, can be an important boost to sales for exactly the reason that it appears on broadly available media. Moreover, as more traditional retailers join the fray on the net, it will become impossible to find product that cannot be found on the net by the consumer from some jeweler somewhere. In some ways, the comparison with Best Buy in instructive. Best Buy has lost important traffic items. Fewer and fewer people buy music, movies, supplies, and commodity electronics in stores. I know I don't. There is no need to. But, as a big box retailer, they wanted to provide the services that people need - an audio room, a repair and installation service, advice on picking out the right computer. Unfortunately, while all that is a plus for the consumer, it is not enough to maintain Best Buy profits. They need the traffic and the day in, day out sales that those lost categories brought. Jewelers no longer sell gold chain like the old days. And fewer people bother wearing a watch, especially the Millennials, who see no need at all for a watch. Many jewelers have shifted to silver, steel and bronze products for opening prices. Never mind buying gold and diamonds off the street as a life-saving way to make money. Worse yet, many jewelers are sitting on cash and not buying new goods and updated styling. Retailers are compounding the effect by dropping brands because of the competition brought via Internet access. There may be good economic reasons to be conservative, as these are uncertain times. But the consumer is in effect being taught that if they want variety of fashion, buy on the net. The result? Last year sales at traditional stores rose in low single figures; Internet sales rose in the 15% range. All retailers have to face a reality. The game is not over in many jewelry categories, but we are in the late innings. There is no escaping the fact that the Internet has to play a key role in survival. Don't fight it. Get into it. I have been going to trade shows for nearly 40 years. That is a mind-bending long time when I stop to think about it, but it does have its advantages. It allows some stripping away of artifacts, distractions that can mask reality. We all speak of how much the "world" has changed, and it has. Over those years we have acquired the PC (and lost secretaries? ), cell phones, hi-def TV, digital photography. The Internet has revolutionized our lives. We have Amazon, Youtube, Ebay and Facebook. We have a billion sites offering a trillion products and services. We have blogs - like this one. The software selling business is going away, and so are many newspapers. Privacy is a thing of the past. In our industry, whole channels of distribution have disappeared (think traditional distributors, catalog showrooms); others have shrunk in number to a handful of giants (think mall chains, discounters and department stores). The Internet has given us countless on-line jewelry stores and diamond dealers. It has also been liberating for small manufacturers who have found a public for their goods spread out all over the world. And that transformation has only begun. The nature of business has shifted. Gold chains used to be a huge business. Now, the number of producers in Italy (once the largest by far) has declined to barely a half dozen, and even they produce very little. Diamond jewelry used to easily carry a couple of carats of goods. Today, other than in the high end, we have been squeezed down to half-pointers and low total weights. Still, for all the disruptive forces besetting our trade, one would think all was fine, judging by the just concluded shows in Las Vegas. There were many visitors and orders were being written. Most vendors did not complain about the show results at all. The jewelry business is definitely not dying and the public has not lost the desire to own precious adornments. But some things were clear. In years past, the jewelry business was a major factor in gold consumption. That is no longer the case. Investors and central bank purchasers are the major factors, which inherently introduces volatility that complicates our lives. For the foreseeable future, there is little reason to think that prices will decline significantly. On the contrary, it is more likely we will see $2000 gold soon, and perhaps $2500 gold next year. More and more, gold will become a metal for the elite, and for bridal rings. But it will also compete more with platinum and palladium. The bottom line is that we saw much less carat gold jewelry. Buyers at the show were writing orders, but they were writing cautiously. But the more they live on inventory, and use sales revenues to cover overhead, the more their capital will erode, and the more the business will concentrate into fewer hands. Vendors are being creative in using alternative materials, in some cases in a wonderfully inventive way. It is clear that many, if not most, retailers have capitulated when it comes to buying gold. Where they fought shifting to silver and other materials for years, many have now adapted to them. The public has shown that it will accept the new direction - out of necessity as well as preference. The competition in these lower price ranges is becoming fierce as more and more companies start producing these new lines. Some of the fat margins that were available even a couple of years ago are getting thinner. In this market, retailers are becoming more aware of the importance of differentiation in the fashion area. That means finding new vendors is important, and that means that the shows will continue to be important. The shows demonstrated that for all the changes we have seen, the business is still here, face to face, vendor to retailer, retailer to consumer. With all the changes, the basic facts remain the same. Consumers want jewelry. Find a way to give them what they want. Man made diamonds: Are they the future? In the last week we have been reading about hundreds of man-made diamonds (MMD's) that were submitted to IGI for grading without disclosure. Various observers tried to delve into the sourcing of the stones. Rob Bates at JCK considered this a serious problem, as it could affect consumer confidence (rightly so), and expressed the hope that there will be some kind of "black box" solution. Chaim Even-Zohar went into a full story about the history of Gemesis, which is being mentioned as a possible source of the stones, though they totally deny that presumption. I suggest that the starting point should be a realistic assessment of what has occurred and has been occurring for some time. And what we need to consider for the future. MMD's (produced by HPHT and CVD processes) and HPHT treated diamonds have been in the market now for years. In both cases, the essential fact is that the temptation not to disclose is powerful. The added profits can be huge. Leon Tempelsman of Lazare-Kaplan, which markets Bellataire diamonds (HPHT enhanced) has complained in the past that his company markets the stones with full disclosure while others do not. There is lots of evidence indicating that abuse is fairly broad and constant - GIA has dropped clients that send in MMD's without disclosure; retailers have discovered these stones in their stock, often by accident; even the major auctions houses, who check every diamond, have found such stones. They are everywhere. I was not surprised some years ago to hear that small MMD's had been salted into parcels of naturals. The world has plenty of people who would not think twice about doing that. "They are diamonds," they would say, "aren't they?" "So who cares." It takes time to "grow" diamonds, whether by HPHT or CVD processes. That tilts production and sales towards smaller goods (at least for now). For the crooks, the fact that larger, better goods are almost always sent to a lab for grading leads them to move smaller goods and find ways to hide the bigger stones. In the IGI case last week, stones from .30 carat to about .75 carat were identified as MMD's. The stones being sent to a lab was something the original supplier might not have anticipated. Common sense tells us that Pandora's box has been opened, and we are not going to stuff MMD's back in. So what are we really looking at? The major impediment to MMD's having an impact on the diamond business has been production levels. We know that production will only rise, and at some point it will rise quickly. As it does, cost will drop, as is the case in every technology. Mine production will tail off in the years to come, according to every informed expert, and the hole could well be filled by MMD's. MMD's have an important edge. They require power, but are not environmentally damaging; can be produced anywhere in the world (meaning not in conflict areas); and could someday represent a consistent and dependable supply. Those facts alone will drastically change how diamonds are sourced, distributed and marketed. Once MMD's take hold in the open market, mining will become undesirable and unprofitable, only contributing to the shift to MMD's. Jewelry manufacturers will support the use of MMD's. There could be significant reduction in the cost of producing a diamond intensive piece (maybe offsetting high gold costs to some degree? ), and continuity of production will be enhanced. Synthesizing materials have been a part of the industrial/technological revolution, and in many cases it was for the preservation of natural resources. We are careful about harvesting coral, minks, lizard skins, and rosewood. Any product that is a luxury is particularly susceptible to attack if abuse, sustainability or environmental degradation is involved. (Oil, as an opposite case, has been the cause of great abuses and wars - but it is, unfortunately, an essential product.) I do not doubt that a strong story could be told about averting abuses related to diamonds in exchange for space-age technology. Isn't it wiser to foresee the rising prominence of MMD's (even if it takes another decade) and devise a great transition that will assure the long term attraction of diamond jewelry? I have felt this way for a long time, and I know that there are many people who disagree. They say that only billion-year old diamonds forcibly extracted from gaping holes in the earth hold the magic that people want. There are many vested interests who dearly want to maintain that. But does anyone really want to rely on that assumption, to base a business on that? Especially when MMD's seem to be selling just fine? One more point. I am not one particularly inclined to believe in conspiracies, but consider this trend. BHP and Rio Tinto want to sell their diamond mines. The Oppenheimers have sold out. De Beers has announced a major investment in Element 6 (their mmd-producing division). Is there something they all know that we do not? Is the old diamond cash cow fading away? I recently appeared at the first conclave for FJATA (Fashion Jewelry and Accessory Trade Association), which was held at Mohegan Sun in Connecticut. My presentation was on the blurring lines between fine jewelry and costume jewelry, and maybe that is a subject for another post. But more important is what I heard as I sat in on the morning's session. The attendees, or most of them, are producers of the kind of products I only see when walking into a toy store or gift shop in a resort. Cheap, and lacking any intrinsic value. The presenters and listeners were all on the tech side, with a few principals sitting in. The organization is only a few years old and its mission is to deal with the flood of governmental regulations confronting all manufacturers. From the jewelry point of view, the outlook is very tough, and I am guessing that we on the "fine jewelry" side have only a faint idea of what is going on - and what we are going to have to deal with. All heavy metals are going to become subject to regulation. We already know about mercury, lead and cadmium. Antimony is now on the boards, and we could be facing European style restrictions on nickel. And then there is arsenic, cobalt, chromium, copper, manganese, and thallium, and probably a few more. Some are actually needed in human diet, but the issue is in proper production, disposal, incineration and excess intake, especially for children. Were it all up to national standards, the various stakeholders and communities could undoubtedly come to a resolution. The problem is that states are taking it upon themselves to set their own standards, which will create (and already has to some extent) chaos for manufacturers. Once confronted with a wide range of requirements (loaded, of course, with paperwork and procedures) the overload will be enough for many companies to abandon the business or stop selling in some states. Even then there is a problem with selling legally in one state but being subject to suits when buyers move merchandise into other states. In some cases, states have bills pending that will totally ban certain metals, which is simply impossible. In Rhode Island, where many manufacturers and distributors of lower priced merchandise are resident, the legislature is considering total bans on lead, cadmium and mercury. That state introduces 2,500 bills per session on average, and hundreds relate to the production of jewelry, toys, etc. There are bills pending that will make retailers responsible for recycling paint, batteries, mattresses and other products that are potentially polluting if not disposed of properly. The logistics for such requirements will be difficult and expensive. and financing, to enforce its terms. Manufacturers who want to comply have no guidance on forms or who to deal with. New York State, by comparison, introduces about 20,000 bills a year, again with hundreds that could impact the jewelry industry. The issues can get quite complicated. The chemistry for each heavy metal is different. So, for example, cadmium "migrates" (that is where it leaches from an object to a human body) at one-eighth the rate of lead. So negotiations in some states have centered around "total" content vs "migration rate". California worked that out. Other states have not. If you use feathers in any way, testing has to verify that there is no bird flu present. One attendant stood to relate that his company is very careful in their factory audits. In his case, manufacturing is done in China (as is the case for many, if not most, other companies). That means that independent labs show up unexpectedly at these factories to test and verify. In the course of a year, this manufacturer spends $1 million on these audits. (Several auditing firms were present to explain the great care they take to properly test, and to avoid any chance of bribery.) This manufacturer proposed that a number of companies join together to test factories they use in common, thereby realizing huge savings in the audits. There was much more discussed at the sessions, but suffice to say that what I heard was enough for me to realize that this is a storm about to break in the fine jewelry business. Yes, fine jewelry manufacturers have had to comply with with various domestic regulations. Now we have the Dodd-Frank legislation ahead, and that could very well require companies to audit foreign factories. The first to react to new regulations will be the major chains, who will impose conditions on suppliers that may be near-impossible to fulfill. I know from many conversations I have had, that small manufacturers and most retailers are totally unprepared to meet this major challenge. It will take a unified industry effort to assure workable conditions. We are coming up to the mid-year jewelry shows, and we will be using those events to measure the state of the industry. At this point, there are enough signs to make us a bit ambivalent on how the rest of the year will go. One one side, the top end seems to be holding up well. It appears that the affluent (and even the super-affluent) are continuing to buy, though at lower average price points. Some reports from guild stores say that sales are good, though dollars are down. That sense of caution seems to be supported by the stock markets, which continue to have declining numbers of trades, leading us to believe that people are sitting on the sidelines and holding on to cash. Charlie Munger, Warren Buffett's partner at Berkshire Hathaway, says that is a bad idea. The value of cash, he says, is being steadily eroded by inflation, and that will only get worse. That may be easy for him to say, as he hold billions in assets, but squirreling away cash only illustrates the concern people have for the state of the economy. Munger compounds his statement by also saying that investing in gold is a bad idea, as it is a static investment, generates no income, and adds value only if the community at large decides that it is worth more. That, he says, is very questionable, even in view of how gold has performed in the last few years. Well, gold just hit the lowest price since the beginning of the year, and has not shown any juice of late. Sure, some say that it is a great hedge against the certain explosion of inflation that is to come. But are investors getting tired of waiting? Perhaps. Sale of gold coins (and silver coins) has dropped considerably in the last months. The public, which had been buying the metal (rather than ETF's or mining stocks) seems to be pulling back. The longer the price of gold stalls, the higher the likelihood of prices falling, aided by people rushing in to liquidate the gold they are still holding in the form of old jewelry. If they have been waiting for the next push up, they may now turn around and sell. Of course, all of this is speculative. Other factors may be more important. Will nations start buying more gold as the euro gets into more and more trouble? Or, will the dollar gain even more strength in that case, pushing the price of gold down? There is not an economist in the world that will render an unqualified opinion. If it was up to our industry to support the price of gold (or not) through sales, we know that the price would be way down. Down far enough to make gold jewelry far more affordable to many more people. As we know, we do not hold the cards in this game any more. In the meantime, silver has taken front and center in the business. No question that silver has become an important, maybe the important, metal for many jewelers. Gold and platinum still dominate the bridal business and there is no reason at present to think that will change. Fashion jewelry, however, is the add-on business that builds traffic for retailers and can spell the difference between profit and loss. That brings us back to the summer trade shows. Will retailers be there looking for fashion lines or will they stick to basic diamond goods and bridal lines? Many continue to do well buying jewelry off the street, and if so, they will have cash to spend. We saw that effect last year. Will the improving economy translate into optimism for the fall? We hope so. Diamonds on the block - anybody buying? The diamond world now feels otherworldly. We got a big hint when the Oppenheimer family decided to sell out, then BHP starts looking to sell their mining operations, and now Rio Tinto jumps in as well. As a major supplier, Russia holds out. Does anyone think that we are seeing "business as usual?" A few added points. Rio Tinto's plan to go underground at the Argyle mine has incurred big overruns. BHP's Ekati mine (its only one) is declining in output. Both companies see little future in diamonds, and present output contributes little to their overall profits. De Beers (now an Anglo-American branch, in essence), in its current round of selecting sightholders, has opened the door much wider for tenders and allowing others to buy diamonds. Then, on Rapaport's reports, we see that about 900,000 diamonds, worth about $6 billion, are listed for sale. And these diamonds average just over one carat in size. That alone is enough for every bridal store in the US to sell a carat+ diamond a week for the next two years. Never mind the huge stocks that are not listed on Rap. These facts do not all pull in the same direction. Mining companies may see growing demand, but finding and developing new mines has become very difficult and expensive. In addition, the outlook for diamond mining ever being an important part of major mining companies' business is about nil. Smaller, dedicated entities, and artisanal mining will continue. The center of gravity will shift to those holding stocks - the major cutters and dealers in the world. The disorganized entrepreneurial nature of that sector of the market is enough to drive miners out of the business. Big stock holders, almost all family run, tend to act and react in personal ways, which are often unrelated to mid-term and long-term business sense. That makes for a dangerous environment for any sizable mining company. Rio Tinto, for example, at the Argyle mine, has now invested well over $1 billion in going underground. That kind of money seeks some degree of stability and long-term continuity, which are not the outstanding characteristics of the business. The issue is further complicated by market uncertainty in small goods, the bulk of run of mine productions. Jewelry production relies heavily on diamonds from 3 points and down, these days even more so on 1 pointers and down, and there has been great reluctance to expand production in that range. This has been the bedrock of Indian manufacturing for many decades, and over most of that time a healthy cash cow. Not so any more. Pressure on margins have steadily increased over the years as retailers grew in size and power and were able to exert leverage in a market with excess capacity and supply. That changed significantly with the Great Recession, which capped a period of declining production, factory closings, and rising labor costs. Major dealers now farm out a good deal of production, and factory owners are reluctant to add capacity unless prices rise. Which they have been doing, driven in part by the very same lack of capacity. Even then, everyone is still focused on the global economy. There is no need here to cover the Euro problems, a struggling recovery in the US, and growing concerns about the Chinese, Indian and Brazilian economies. So how does one justify the expense, and risks, of opening factories? On balance, the decisions by the major mining companies to get out makes perfect sense. And Anglo-owned De Beers is moving as quickly as possible towards a revision of their business model to make that business as salable as possible. Now the only question is - who will want to buy these operations? Hong Kong Show - mega-business or mega-bust? The Hong Kong Show had more energy than any show we visited this year. The crowds were big, though mostly Asian. The show is bigger than ever, now probably the biggest in the world, and it has expanded to occupy odd spaces and ballrooms. 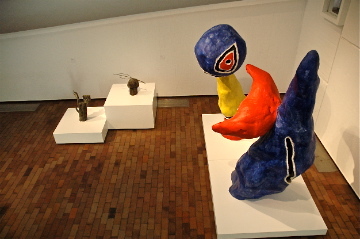 The early impression was that the show was a hit. Then again, maybe it wasn't for many vendors. Traffic in many aisles was heavy, but many vendors were not happy - "lookers, not buyers." I had no problem stopping almost anywhere for a chat or to work, with few other buyers coming in to the booths. Among the hundreds of loose diamond vendors and stone dealers, for example, the business seemed more about selling each other than to retailers or manufacturers. Yes, there were some good stories. One Hong Kong jewelry manufacturer related that business in the very high end was reasonable, but business in middle-priced 18 karat and diamond jewelry was "totally dead." He also wrote huge orders on a ring and pendant set (18 karat and miniscule single cut diamonds set in featherweight mountings), priced at $150. He booked 80,000 sets or $12 million in business. Where are they going? Mostly to Russia. It will keep him busy for three months. But these imbalances make him very nervous. On the top floor of the convention center, in a beautiful space, are the top tier exhibitors, selling to the super-rich for whom the price of gold or diamonds are not a barrier to buying. I heard of million dollar plus sales orders. But even here, most of the vendors I spoke to said traffic was there, but buying was slow. Seeing the variety and quantity if diamonds here and in the hall filled with diamond companies, one wonders just how much of a shortage there really exists in larger stones. Small goods are another issue. That's a subject for another post. The tusk is clearly old. The price is $200,000. And, tucked away in corners were specialists. I saw one small booth filled with carved mammoth ivory. The Chinese vendor swears they are all carved from this pre-historic ivory! Is there such a supply? Talk about a niche product. The carvings were very well executed, ranging from small objects, to dragons. The work is all done in some small Chinese village where everyone, apparently, is involved in the trade. The vendor, seeing i was from New York, made a point that among her customers are several Park Avenue residents in New York. The main floors were tough to work. The Show divided vendors up by country, but sometimes not. The condensed show guide listed exhibitors by country, not alphabetically! What a pain that was. Where the floor placement was based on category, the show displayed critical mass on a scale we do not see at other shows, except perhaps for watches in Basel. Visiting the halls for pearls and beads was overwhelming. There were huge piles of pearls in sacks and piled on tables; strands of beads in such quantities as to beg the question - how does a buyer deal with this? One upscale pearl dealer, out on one of the main floors, deplored this display. He said that the massive overproduction of fresh water pearls and South Sea pearls is destroying the business, or at least killing the ability of most suppliers to make a profit. He was particularly upset over the destruction in the value of South Sea pearls. The deluge of pearls has parallels in other categories of jewelry. The jewelry floors are dominated by Chinese companies that have, for example, taken similar routes to product development of diamond jewelry. Take tons of small goods, mount them up in tons of rings, and lay them out in indistinguishable, jammed, trays. Their interest is focused on adding value to diamonds and using a range of qualities. In some cases, the mix of color, clarity and make was laughable. (Why spend time and effort assorting half-pointers?) The styling is abysmal, repetitive and old, old, old. Any sale of any amount is fine for these vendors, so long as it is immediate cash. I walked the aisles (all of them!) seeking companies that had some idea of design, marketing, quality and merchandising collections. They were there, but few and far between. I saw the same approaches taken by vendors at other shows this year. A near desperate adherence to historic gold and diamond design, in a vain hope that the old days will return; a literal translation of traditional designs to silver and base metals, which fails terribly most of the time; and a general reluctance to expend effort and money on new collections and concepts. The fact we all face is that the mid-range market is still there, significantly reduced in size, probably for years to come, and there is not room for everyone. The pie is smaller, so the slices need to get bigger. So, on one hand, an endless number of Shambala-like and Pandora-like displays, but in all sorts of lines. On the other hand, a refreshing handful of vendors who have stepped out in front and will lead the way. I hope the summer shows are more promising.